Firstly, a big thank you to everyone who commented in response to my recent vintage pledge plea! After receiving lots of brilliant and very helpful advice, I agree that the best way forward with this dress is to take a bit of a break from it before trying again from a different angle. In the meantime, I thought it would be good to work on a totally different vintage pledge project – one that I had been looking forward to for a while. This 1972 shirt dress pattern, Style 3685, is one of several beauties I found in my grandmother’s collection. She passed away while I was a child and although I can vividly remember her having a big, heavy sewing machine, I don’t remember her sewing. 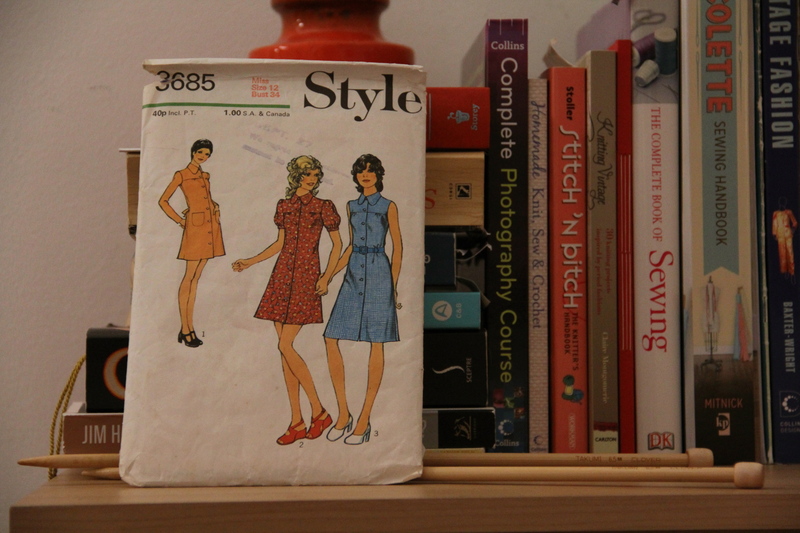 It was a lovely surprise when my father found a box filled with her old sewing patterns from the 50s through to 80s last summer. I put a few aside to make when I had built up better sewing skills. I picked up this lovely floral rayon at a Jo-Ann’s branch while visiting family in America over Christmas. (I really wish there was somewhere like it in Ireland – they had just about any sewing or knitting implement you could think of!) I don’t have many florals in my wardrobe and as this was at the ridiculously low price of less than $5 a yard, I thought I’d try something new. I’ve left off the topmost button – the one that should close the collar. The space on the collar opening for putting in a button and buttonhole is pretty tight so I could really only put in a small, shirt button. 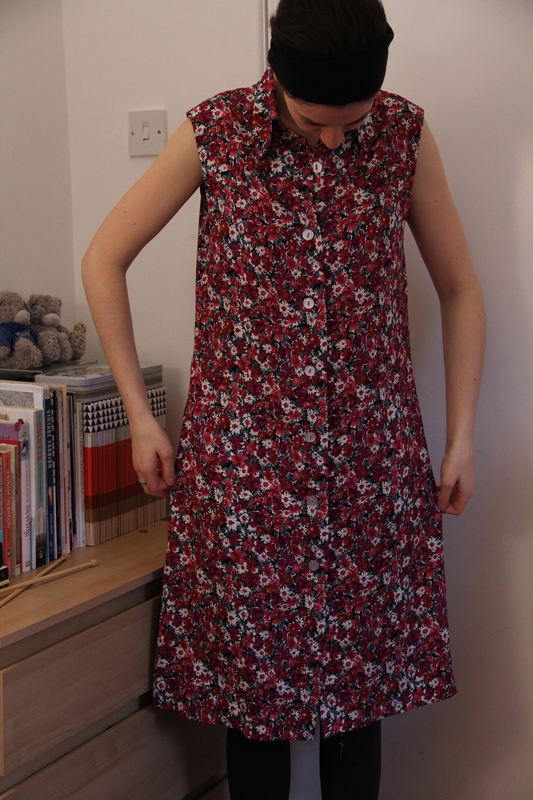 However, I’m holding off to see how I like wearing it without a collar button before risking inserting a buttonhole there – I had some problems machine-stitching the buttonholes in along the dress front and finished half of them by hand. As you can see, the dress is a bit too big (I’d say almost a full size too big), but I wanted the option of a loose-fitting dress for hot weather AND something that I could layer vests and tights under in the colder months, so I’m pleased with the finished piece. 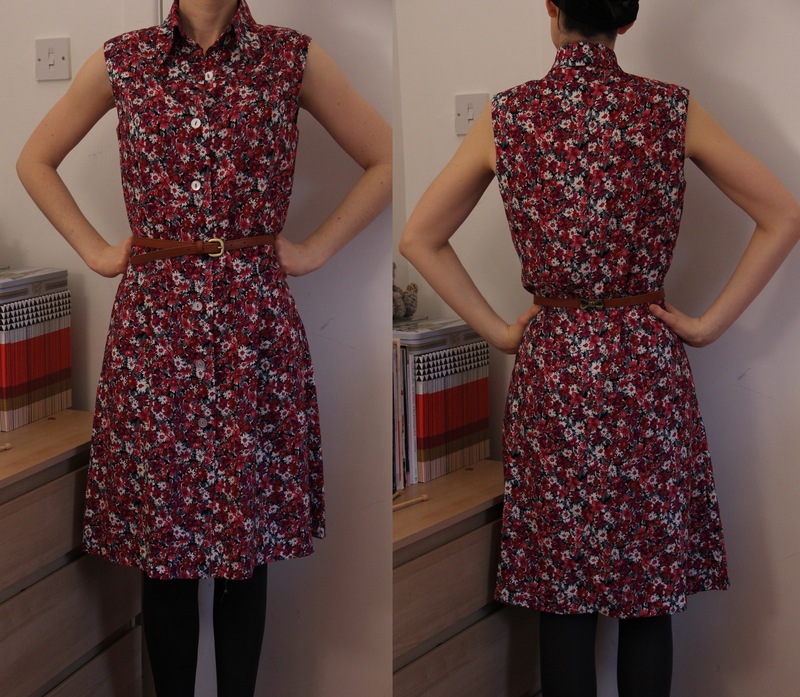 Skills learned: Generally making a shirt dress! I don’t know if it’s typical of shirt dresses or not, but the way the front facings were incorporated into the front panels and folded back in around the collar base makes the front section really smooth and helps it all sit tidily. Recommend pattern? : Yes! Although some parts were a bit tricky, the instructions were very straightforward and I don’t think this is a difficult make. I’ve been shoring up shirt dress patterns for over a year now but had yet to take the plunge and found this a great introduction to them. I’d like to give it another go, in a heavier fabric, but I’d probably take in the side seams and shoulders for a tighter fit if there was less drape than with this rayon. 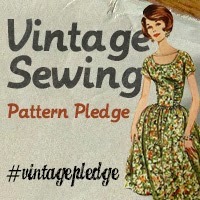 Are you taking part in A Stitching Odyssey’s vintage pattern pledge? Or have you worked with family-owned patterns? Shortly before Christmas, I realised just how limited my ‘work wardrobe’ has become of late. Most of the jobs I’ve worked over the past five years have not required anything other than smart casual clothing. 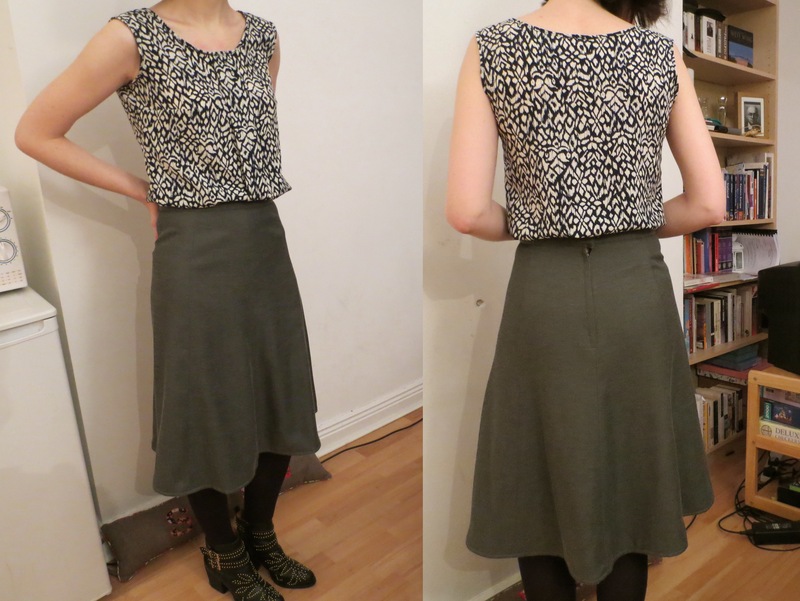 So, in the spirit of smartening up the casual a bit, I decided to make a grey skirt that could be easily matched with the tops, shirts and cardigans I already own. 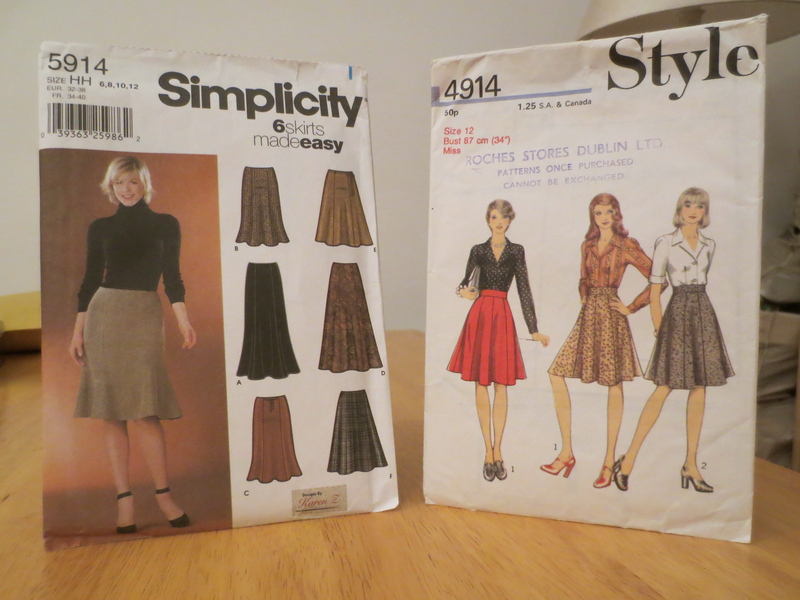 The main body of this just-below-the-kneee skirt comes from Simplicity 5914, one of my mother’s patterns (I’m not sure she ever made it herself, mind). The copyright is marked 2002. The waistband comes from one of the patterns I ferreted out of my grandmother’s collection, Style 4914 from the early 70s. I find wide waistbands so much more comfortable to wear than the narrow kind, especially when it comes to eating and sitting down – crucial factors in my pattern selection process! The fabric is grey suiting from MyFabrics.co.uk which was reduced to clear. To be honest, I’m not sure which side of it is the ‘right’ side: one side is a darker grey and smooth to touch, the other is a lighter colour and feels like a thin brushed cotton. I can’t imagine a suit made out of the brushed side, but I think I might have a go at making the Colette Truffle dress (minus the front flappy part) with it. And speaking of Colette Patterns, the top in these photos was made with their free pdf download, ‘Sorbetto’. It’s a really quick pattern to use, but I did decide to make matching bias binding which always takes a bit of time. The fabric is some kind of mysterious poly-something-blend from Murphy Sheehy in Dublin and was really nice to sew – it wasn’t slippy and didn’t fray to nothingness along the edges. One change I will make for future Sorbettos is the length – it barely comes to my waist once hemmed (and even then, with a small hem) which is fine for tucking in to skirts but a tad too short for me to wear un-tucked. Skills learned: Working with a busy-print fabric for the Sorbetto; incorporating different design elements of different patterns for the skirt. 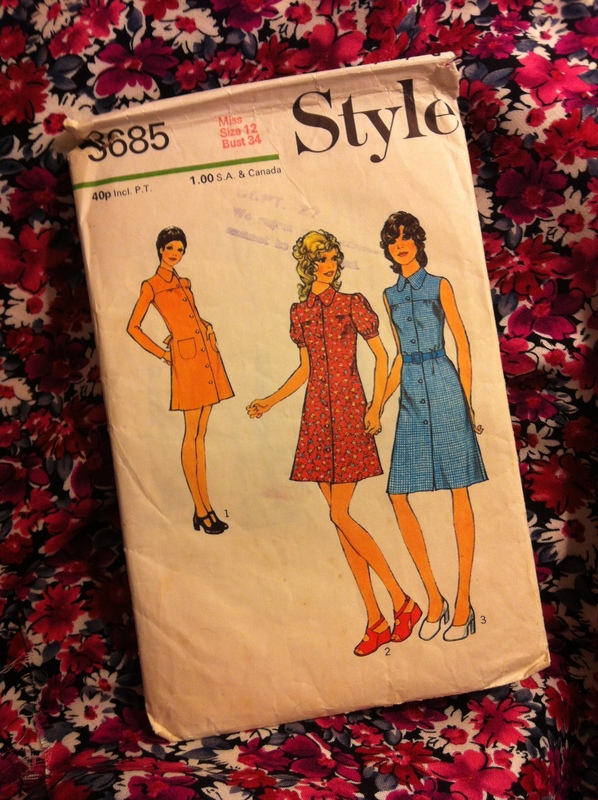 Yesterday, Marie at A Stitching Odyssey outlined her plan to focus on working with the vintage patterns already among her (amazing) collection and I’ve decided to join in, pledging to make at least three pieces from my (much smaller) assortment. For a while now I’ve been planning and re-planning projects involving these family patterns, but for some reason I feel more daunted by those than the vintage ones I picked up elsewhere. (Maybe I don’t want to ‘waste’ them…?) I’m visiting friends over the next week, but when I get back I’m going to start working on actual, tangible projects to meet my three-pattern pledge. Here goes!